There are a huge number of websites that suggest lists of home improvements that will best benefit the bottom line when reselling. I have taken my experience as a REALTOR that focuses on property for sale in Bracebridge and Muskoka to prepare this list for you. Curb appeal is perhaps the least expensive and most effective improvement. Beautify the first impression of your home or cottage. Home improvements such as landscaping your front lawn, adding some plants and shrubs in your yard, and cleaning up the exterior of your home do not cost a lot of money but can make a huge difference to the way your home is perceived by buyers. Remember you do not get a second chance to make a first impression! 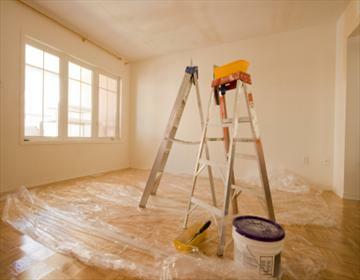 The second most effective improvement, for a quick resale and also fairly inexpensive, is a really good de clutter and a fresh coat of paint. Take this opportunity to tighten door knobs and do the minor repairs you have been meaning to do. This will not only make it look clean and bright but is an awesome way to force you to pack up some of your stuff and create more room. Remember to go neutral with the colours, you will not be living there, so they do not have to be colours you love. Choose bright light and neutral colours but do pick a colour, builder beige or white can be cold and uninviting. While labour intensive, this process can increase the value considerably and perhaps, just as important, the speed that your property will sell. Buyers pay close attention to the bathrooms and the kitchen. These areas demand the bulk of your home improvement budget. Refreshing them with new countertops and flooring will usually net you a good return on your investment. Adding a second bathroom to your home, if you have room without losing a bedroom, especially if it is an en suite will be an advantage. A garage can add considerably to a home’s value providing there is adequate room on your lot to achieve this. The cost of the construction can be prohibitive but in this area will usually be totally recovered in the sale price. If your home does not have a fireplace, think of putting in at least one. Gas fireplaces, either natural or propane can be easily installed and not only create a heat source but they add a visual feature to your home or cottage. These come in many styles from modern to traditional or even more rustic “wood stove” style so there is sure to be something for you. Bringing the laundry room up from the basement also adds to the resale value, consider putting it in a closet in a bathroom or even the kitchen. If space is an issue perhaps a stackable unit will work. There are a few things that will not bring you a good return on your investment. Windows may need to be replaced but will not likely make you any profit. The profit from investing in windows comes from the saving in utility cost over time. Unless your windows are so unsightly that a buyer will be focused on them to the exclusion of other features just clean them up. Make sure the bottom tracks are not all black from condensation, paint frames but do not replace. Expensive flooring like hardwood or marble and ceramic will also not bring you a great return on investment. Your flooring should be in good repair and clean but unless damaged or torn or very outdated, being clean will be sufficient. Professional steam cleaning can revitalize and old carpet. If it is loose and wrinkled consider having it stretched by a professional installer. If undertaken properly and done right, home improvements can indeed add to the resale value of your home. While I am not a contractor or a decorator, I am a top producing Realtor with lots of experience selling real estate in Bracebridge and Muskoka. I would be delighted to meet with you and help you determine what improvements would be a good investment for your property. Please call me anytime for a no obligation consultation. http://www.KarenActon.com .